Life of Pi might not make you believe in God, as a character in the film suggests. It does, however, make you believe in the power of story, the way humans use them to explain or overcome trials the world deems necessary to drop us in, one of the many things that differentiates us from the wild creatures of the animal world. Based on Yann Martel's award-winning novel and directed by the visually masterful Ang Lee, Life of Pi the movie is a banquet of beauty, a compelling story told through remarkable visuals. A million miracles align to make great film, and God, or whoever you believe in, was working overtime on this one. Pi, played throughout most of the film by newcomer Suraj Sharma, is a young Indian boy who lives in Pondicherry with his parents - a loving mother and stern but fair zookeeper father. Pi is a precocious child, always interested in learning about and studying new religions and the beliefs that come with them. His father believes that one who follows many religions may as well believe in none, but the boy understands the power that comes from each system of beliefs. His eclectic knowledge helps him figure out the world and the events or miracles that happen within it. But the boy's strength is tested when, while transporting all of the animals of the zoo to Canada, the family's ship they are traveling on sinks in the Pacific Ocean. Pi is left on a small lifeboat, the only human survivor, but he is not alone. He is joined by an orangutan, a hyena, an injured zebra, and Richard Parker, a Bengal tiger Pi's father incessantly warned him about. Soon, the number of surviving animals on the lifeboat dwindles, survival of the fittest meeting its expected but horrifying end, and Pi and Richard Parker are left to co-exist on the floating vessel. As with Martel's novel, Life of Pi sounds like a film that could easily test the boundaries of our attention span. The thought of a film about a boy and a tiger trapped on a small boat together doesn't immediately sound as if it would be ripe for interesting story turns and moments of visual brilliance, but all of that doubt gets swept away as soon as Lee and crew begin introducing the magnificent wonders the depths of the ocean has to offer. Beautiful fish who illuminate the water at night with a blue glow, waves of flying fish, and even the awesome force of whales rising up and breaking through the surface of the waters are only a small taste of the window dressing this story has under its wing. Ang Lee is no stranger to this level of ambitious, visual storytelling. This is the man who gave us our first, cinematic look at the Incredible Hulk as he is perceived today, so there was never doubt that Life of Pi, with the incredible descriptions of Martel's novel, would be a feast for the eyes. Lee and his cinematographer Claudio Miranda find brilliance in even the most mundane-sounding scenes, turning the glistening water of a calm ocean into a mirror that reflects a blue, cloudy sky. A time or two the horizon is left ambiguous, and wide shots give the impression of the lifeboat floating through a star field. Such shots could be set aside and considered gratuitous, and in many other films, style-over-substance is a critical bomb that's just waiting to be lobbed. However, Life of Pi is every bit as moving as it is incredible to look at, the relationship between Pi and Richard Parker growing with every second of screentime the two share. It helps tremendously that the visual effects on the tiger, and every other animal in this film for that matter, are seamless, rarely ever making you aware of when digital effects are being used. There's never a question of validity when it comes to the space between these two characters, and Lee and screenwriter David Magee do an impeccable job of crafting a connection that's every bit as powerful as one between two human actors. Sharma's performance goes a long way in that, as well, the newcomer finding effortless ways of holding his own against either an animal actor or the absence of an animal altogether. Pi runs the gamut of emotions in the film, and Sharma never falters, never becomes disjointed in changing his moods. Irrfan Khan plays Pi as an older man, telling his story to a writer, and he brings his expected A-game in every scene. The story never feels broken when it shifts to the present, but watching Sharma in his scenes and realizing how much he brings to such a limited stage is remarkable. Visually stunning and narratively astonishing, Ang Lee's Life of Pi is the kind of cinematic experience that gives new life to the art-form. In the end, the ambiguity the story leaves us with is a necessary one. We're never supposed to understand the full nature of the world, and it's in the details left out or aspects that occur against the very fabric of reality that helps grow our belief in something greater. Life of Pi may or may not make you believe in God. The potential for both is in there, but the way it tells this particular story makes the power such narrative journeys give off undeniable. It couldn't be more beautiful. It couldn't be more miraculous. I'll have to wait till december, but I guess it will be worth it! I saw the movie today and it definitely deserves a 10/10! I'm not kidding, I went to see it because I work with animals and love shipwreck survival movies. Those were the intentions I had seeing it, but the movie offered so much more to it that just those characteristics. The colors, the music, the whole story was so unreal and mesmerizing ...the 3D really did a superb job. And as Jeremy stated, the tiger was flawless, I mean it really looks like a real tiger was shot through the film (think of the cgi in ROTPOTA, but better). I seriously can't explain how fantastic that movie was...I laughed, I cried, I loved it. Everyone should definitely see this movie! It looks very good... To bad I am boycotting this movie for being force fed Facebook feeds advertising it into my news feed despite blocking it 11 times and complaining to Facebook. Before you jump on me for the statement know that I contacted the official sites moderators and was told " We paid for the right to advertise the film on Facebook. As such it will always appear in various feeds". That is supposed to be a space under my control as to which I choose to see or not. If you think that the movies rights supersede my own, then I will not furnish my approval for the actions by giving them my money. It is, after all, just a movie, and while I am sure I would love it, my ethics and principles are far more valuable. Shouldn't you be boycotting Facebook instead? I'm pretty sure Ang Lee has nothing to do with it.. 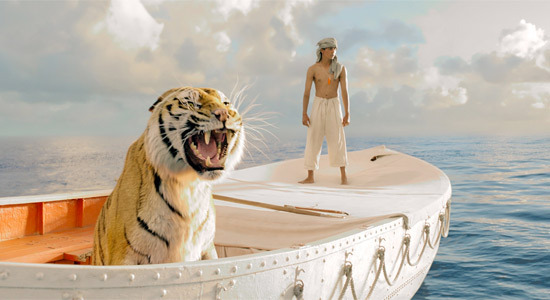 I spoke to the Life of Pi Moderators who are hired by the studio to promote the movie. They are the ones who told me that because they paid they had a right to pollute my feed. Facebook is looking at their policies and apologized but told me they were under a contract and have to honor it. That's pretty fucked up. Facebook is pretty overkill on all advertising at the moment. I could see it turning people off. Loved it!!! It was spectacular and visually stunning! One of the best movies since Avatar! This deserves an Oscar!